The National Harbor project is being developed as a mixed-use development on an approximately 540-acre waterfront site in the Oxon Hill area of Prince George's County, Maryland. The project features approximately 1.25 miles of waterfront development along the banks of the Potomac River with views of the District of Columbia skyline. The development, located at the intersection of Interstate 495 (the Capital Beltway) and Interstate 295, is proposed to include approximately 7.3 million square feet of development, including retail and restaurant space, office space, a convention center, hotel rooms, and 2,500 residential units comprised of a mix of apartments, condominiums and townhomes. 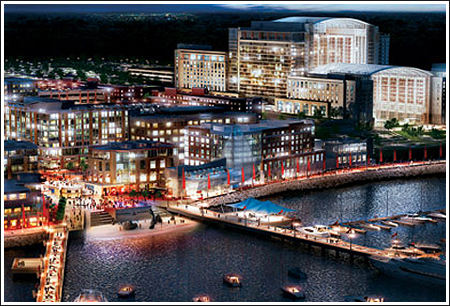 Upon completion, National Harbor is projected to be valued at more than $2 billion. In 2004, Prince George's County issued Special Obligation Bonds in the amount of $65,000,000, as a limited public offering. Bonds were issued to finance public infrastructure, including, but not limited to, roads, stormwater, sanitary sewer, and water. Security for the bonds include tax increment revenues, hotel tax revenues, and backup special tax revenues. In 2009, Prince George's County issued Taxable Special Obligation Bonds in the amount of $35,000,000 to finance parking facilities. Security for the bonds include special hotel rental tax revenues. Other sources of financing for the project include debt, equity, Maryland State Highway Administration funding, and Maryland State funding. In 2005, Prince George's County issued Taxable Special Obligation Bonds in the amount of $95,000,000, followed by an additional $50,000,000 in Taxable Subordinate Special Obligation Bonds in 2008. The bonds were issued to finance a convention center at National Harbor. Security for the bonds include tax increment revenues, hotel tax revenues, and special hotel rental tax revenues. Other sources of financing for the project include debt and equity. Tax increment financing was instrumental in making a major economic and tourist development project a reality at National Harbor. Prior to the issuance of bonds, MuniCap, Inc. served as the financial consultant to the developer, preparing the TIF plan of finance and feasibility analysis. Once bonds were issued, MuniCap, Inc. transitioned into the role of administrator to the National Harbor Development and Special Taxing District, as well as the National Harbor Convention Center Development District. As administrator, MuniCap, Inc. ensures compliance with the Securities Exchange Commission and Internal Revenue Service by preparing the required reports and documents.